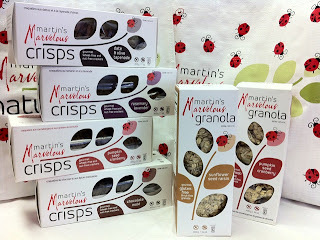 GF Ontario Blog: Martin's Marvelous Crisps - Giveaway! The folks at Martin's Marvelous Naturals run one of the few gluten-free, nut-free, egg-free manufacturing facilities in Canada… and they have a commitment to make the best tasting Crisps and Granola (gluten-free or otherwise)! Everything is made in small batches using more than 90% Canadian ingredients without the use of any artificial colours, flavours, or any preservatives. Please note that Martin's Marvelous Crisps are made with pure, uncontaminated (wheat, rye and barley-free) oats. In Canada, products containing oats are not allowed to be labeled gluten-free due to Health Canada regulations. Some people with Celiac Disease may have issues with these pure oats even when they do not contain gluten. Oats from major brands (e.g. Quaker) are likely contaminated with gluten and should not be consumed by those with Celiac Disease. Which creative toppings do you like best on your crackers or crisps? This contest is open to Ontario residents only! (This is Gluten-Free Ontario, after all) The winner will be chosen by Martin's Marvelous and I will post the winner's name by Wednesday, March 14, 2012 on Facebook, Twitter and on this page. I like to make mini-pizza's on them: pepperoni or ham, depending on what we have, a slice of olive and and some daiya cheese. then I stick them in the oven real quick, just enough to melt the cheese. I have to fight my brothers and sisters for them usually! I love mixing red pepper jelly with imperial cheese- so addictive as a dip!! Can't beat a slice of pear or tart apple and a tiny bit of brie or a smidge of Canadian made Dutchman's stinging nettle gouda cheese (made in Nova Scotia --> spreadable smeerkas is gluten free! )....place under the broiler to make it good and melty. I like to enjoy this with a glass of wine. The perfect appetizer for guests as well. I like to add hummus and hemp seeds. Great nutty flavour and raw hemp seeds are full of nutrients and are, of course, gluten free! My kids think this is crazy...but my favourite cracker topping is havarti cheese topped with strawberry jam. Yum! I love crackers with this dip: a tub of hummus, spread into a dish, topped with olive tapenade, topped with chopped sun dried tomatoes and parlsey. Delicious, and very quick if you use packaged hummus and tapenade. I make a vegan, GF 'cheesy' spread from soy milk, hummus, nutritional yeast, and a few other ingredients (the recipe is from The Uncheese Cookbook). Mmm! Chickpea hummus or whitebean hummus from dry beans I make and a pinch of chipotle sauce is my personal preference for a cracker. I love topping my crackers with some roasted garlic, spicy red pepper jelly and warm brie. The most delicious combination every!! Lately I've been pairing my crackers with delicious cheese boards. Baluchon dessert cheese with some fig jelly atop a crispy cracker is amazing. I like to put cream cheese and Scotts Ginger Conserve (GF) on a cracker to eat. Absolutely delicious. I love topping it with cream cheese or hummus with cucumber slices. While all these responses look delish (I have gatherered some great ideas!) my all time fav is Bean Slather (white beans, carmelized onions, rosemary, balsamic vinegar, olive oil, and goat cheese). My friend made it especially for me once and been making it regularly ever since! I love guacamole with lots of garlic & lemon... or cream cheese and red pepper jelly!!! Yummo!!! It may sounds strange, but I like to combine hummus and tuna and spread it on my crackers. Its actually delicious! My favorite topping for crackers is cream cheese and apple slices! Yum! I am excited about this giveaway.. not often we find products my entire family can have with our various allergies! I like hummus and (home sprouted) alfafa sprouts on my crackers. surprisingly delicious! Mmm, try some peanut butter and banana slices! also maybe nutella.